My Reasons to Pray from A to Z - A Rose Is A Rose Is A Rose! Allegiance I have immense faith in the powers of the God. Blessings Prayer binds me to God. When I pray, I am inviting God’s blessings into my life. My prayers are for seeking blessings in general, for God knows best what is best for me. Comfort And that gives me a lot of comfort and confidence. Dialogue My prayers are like a dialogue or a conversation with God. Endurance I pray because prayers give me the courage to face difficulties or challenges. Guidance God guides me in prayer to take the right path and to find strength during difficult circumstances. Healing A prayer to God heals, when my loved ones are sick -physically or emotionally. Inner Peace When my mind races and obsesses, when I’m worried and anxious, a prayer to my God puts peace in my heart. Kindness or through the kindness of others. Love I feel God’s love, His compassion, His encouragement through prayers. Merciful As a human, I do so many wrongs and regret later, an earnest prayer to God and I know I’ll be forgiven, for God’s mercy is unlimited. Needs I pray to God for my various needs. Although these prayers are not magic bullets, they do help me, nonetheless in dealing with temptations, fears and doubts, or other threats to my peace of mind. Protection A prayer is like a proven shield of protection from all harms of soul, mind and body, available from God all the time. Quiet I pray to hear and feel the gentle presence of God around me. Relationship A prayer strengthens my relationship with God, it nourishes my relationship with God which is so illuminating. Safety Net A prayer to me is a safety net that helps stabilize my mind and body. It gives me hope when I feel inadequate. Thanks I also pray to praise and thank God because of his great kindness and mercy. I thank God through my prayers for all his blessings that he has showered in me and my loved ones! Understanding Through prayer I am able to understand things that confuses or perplexes me. Vibes When I pray, I experience good vibes and that helps me to generate a positive state of reality around me. Wisdom God imparts His wisdom and understanding through prayer. Xtra Power God is all powerful. Powerful to heal, powerful to save, powerful in every sense of the word! And prayers help me see, experience His powers, it helps me to plug into the extra power of God. Yes or Not Yet As I pray, my trust in God allows Him the latitude to answer however He deems best, which could be Yes or Not Yet! Zen I experience Zen when I pray. While I believe in the magic and powers of prayers, I am a bit rustic when it comes to celebrating festivals with traditional rituals. 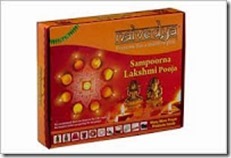 I came across Sampoorna Lakshmi Pooja Pack which is a pack containing everything that one would need to perform the Lakshmi Pooja on Diwali in a traditional way. This pack contains all basic materials required for the pooja as mentioned in the Skanda Purana. The booklet (script in 6 languages) and audio CD have the procedure, necessary shlokas and Shree Vinayak Ashtottarashata Naamaavali for performing the pooja. This pack comes with instructional booklet & CD, with options to recite the shlokas along with the CD if you wish. The set itself has everything I would need in one package – agarbathies, camphor, kumkumam, aabharanam, gandha tablets, rangoli powders and stencils, deepam and sambrani among 20 essential ingredients for the puja. The pack also has Ganga-jal and idols of Lord Ganesha and Lakshmi Devi. This Diwali, the Lakshmi Pooja at our home will be simple and effortless yet traditional with this pooja pack. This post is part of a contest by Cycle Pure Agarbathies. Amazing…next time I feel that why do I need to pray, here I have my reference points. I loved this and found many of my own reasons here among your list. Without even thinking about it, some of the less obvious were also reasons why I pray. Prayer is so wonderful, especially when God answers and guides you in the direction He wants you to go. This was a beautiful post and touched me in many ways. This is an awesome post, Shilpa. I am not really a dhoop-batti kind of a religious person but I do believe in the power of God and pray to Her often. Very nice and innovative Shilpa. Liked it very much. Thanks for the nice post. I also believe in the power of the prayer. What is a gandha tablet? I am not too sure about Gandha Tablet. But Gandha means aroma or smell. I came across this on the web… Gandha is the fifth of five tanmatras, “primal substances,” from which the gross elements, mahabhutas (or panchbautikas), arise in the evolution of the tattvas. Smell is the tanmatra corresponding to the earth element, prithivi. Will check out more about it in a short while! Ah! Pls ignore the above explanation. Asha explained about Gandha tablet in the comment section below. She says, Gandha is sandal wood in kannada. The chandan is in tablet form. It has to be soaked in water to make a paste. Hope that clarifies! Very soulful read Shilpa. The soothing feeling when one prays is unparalleled… I chat about with God too, more like a friend and confidant, just sharing my thoughts aloud sometimes feels very relaxing . Agree completely, Reshma. Praying soothes and calms the mind. Wow….That was quite a list !! We all pray, but most of us don’t pause to think why we do…. this is a wonderful compilation of those positives that we draw out of our prayers. Superb !! Thanks Sreeja. Glad you relate to this post! Wow! This is worth framing!! nicely listed. I too have faith in prayers. BTW, gandha is sandal wood in kannada. The chandan is in tablet form. It has to be soaked in water to make a paste. Have you checked the cycle pure agarbathis advertisement? The feelings are pure even on screen and emits positivity. Yes, I have seen the advertisement and liked it a lot!! Great Shilpa. The list is so exhaustive that I read it it three times to grasp it . Basically I am too a prayer person, So thanks for sharing Shilpa..!!! Shilpa all your a-z takes on things are super cool!! !